Can't attend? Follow Maya Dance Theatre to know of future events! The saintly demeanour, silent support, unwavering loyalty, implicit acceptance and quiet intellect of a woman have often been misconstrued as signs of weakness. Joan of Arc, the revered French saint and Sita, a respected symbol of purity in India and Indonesia; are two women who ironically faced betrayal by men in power despite proving their allegiance. The production ‘When the flames blaze the caged body, I surrender my soul, I Am ...’ delves in to the emotions and pain that these two women experience from this unexpected test of fire. Has the fire truly ceased? Are they trapped in the flames? Can it destroy their spirits or has it just ignited their souls? Artistic direction and concept-choreography by Kavitha Krishnan with co-choreographer, Esme Boyce (NYC, USA) and music composition and live performance by Peni Candrarini (Solo, Indonesia) with musician, Kailin Yong. Visual artist, Muhammad Izdi, will partner, with Kavitha Krishnan, for the first time in this new creation. Dramaturgy and character development by, Nirmala Seshadiri, a multidisciplinary artist, choreographer and National Arts Council Young Artist Award recipient. Log on to www.mayadancetheatre.org for more info. 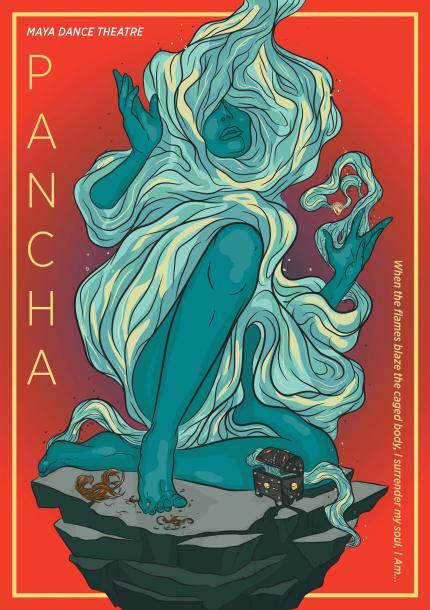 Created and conceptualized in 2016, PANCHA is a dance series drawing inspiration from expounding female archetypes in relation to the five elements based on Hindu philosophy - wind, fire, earth, water and aether. Each work in the series is centred on one element, and each element sets the stage for the female archetype who is trapped within social and relational frameworks. Women are typically seen as elemental and emotional, rather than rational and logical. PANCHA uses the logic of emotion, the consequences of history and cultural environment through storytelling and metaphor to relate to these 5 different female archetypes, often blurring the lines between myth and reality!